Deidre and JG learn how to build trusted relationships with this week’s guest, Leslie Grossman. Leslie Grossman, author of LINK OUT: How to Turn Your Network into a Chain of Lasting Connections, is a Vistage Executive Coach to CEOs. She's on the adjunct faculty at George Washington University's Center for Excellence in Leadership and presents workshops on how to become the leader of your life. Leslie is passionate about the impact trusted that conversations have on everyone’s life. She believes that the secret sauce for success in life, business, and career is trusted relationships. Everyone can have them when they know how to. More information about Leslie can be found at www.lesliegrossmanleadership.com. Don’t let your judgement get in the way. 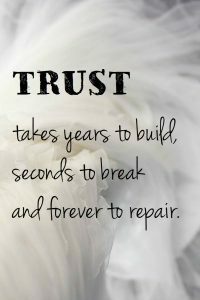 Trust can’t be built where judgement is present. Find yourself a collaborative entourage. This is group of people that you help and support, and that also help and support you. The relationship should be reciprocal. Be curious about people. When we are interested and curious about other people, we begin to build trust. Before letting someone in to your entourage, asses their commitment. Will this person do whatever it takes to keep their promise even when times are rough? Are they going to be there for me? Learn to be a good listener. 50% of communication is listening. Do more listening and less talking. Make yourself available and approachable. Make it easy for people to reach out to you for help. Look for honorable intent or honorable motive. Does this person have a genuine interest in helping you? How do you build trusted relationships? Let us know by leaving us a voicemail at 1-646-653-9278 or sending us a message here.